Northern Dancer, Mr. Prospector, and Nasrullah. Three of the most recognized and sought after influences in the history of the American bloodstock market. Revered for generations, these three stallions represent the upper echelon of genetic material found in the United States. It is through the study of these influences that most industry newcomers begin their education of American pedigree patterns. Of course, the entire pedigree of an individual cannot be comprised entirely of these influences. Certainly, there is room for less recognizable male influences and it is the astute breeder who can recognize more obscure, perhaps underrated influences that are sufficiently potent enough to carry their share of the genetic pattern. Though not always found in the male sire-line, these influences have proven to be valuable commodities in a variety of pedigree positions, and even though you’re unlikely to hear their names at a gathering of pedigree experts, they carry a degree of My Babu (1945) genetic strength that can be utilized by breeders working within the constraints of a budget. Ack Ack (1966, 581 foals, 55 SW, 2.35 AEI)-1971’s Horse of the Year, Ack Ack seldom finds his way into discussions of genetic elites. Though he sired a steady stream of stakes horses during his days at Claiborne Farm, his male-line influence is unlikely to extend beyond Broad Brush, with the possible exception of Include, a multiple Grade 1 winner who’s first foals are being well received in the marketplace. Undoubtedly however, we will continue to see his name amongst superior runners here in the United States by way of his daughters (currently getting just under 10% SW from starters) and the daughters of Broad Brush. Al Hattab (1966, 365 foals, 44 SW, 2.18 AEI) – A precocious yet durable racehorse who found himself a frequent bridesmaid during the 1969 Triple Crown prep races, Al Hattab enjoyed a solid and consistent career in the breeding shed. Though he never menaced as a mail-line influence, his daughters have flourished as broodmares, getting 70 stakes winners and two Horses of the Year in Black Tie Affair (1991) and Holy Bull (1994). Eight Thirty (1936, 299 foals, 44 SW, 2.27 AEI) – A tremendously quick, early-developing type who could carry his speed over middle distances, Eight Thirty would go on to replicate his quickness more often than his staying power. Conformed in the tradition of the modern Quarter Horse, the influence of Eight Thirty can add an early turn of foot like few others can. Though he did get the successful sire Bolero (the broodmare sire of Storm Cat’s second dam, Crimson Saint), Eight Thirty is best known as the broodmare sire of leading sires Hold Your Peace and Cornish Prince. Exclusive Native (1965, 507 foals, 66 SW, 3.65 AEI) – Since his glory days of the 1970’s where he got two classic winners, including just the third filly in history to win the Kentucky Derby, Exclusive Native has become somewhat of a forgotten branch of the powerful Raise A Native line. Even though his male line saw a brief resurgence in this country recently through Brazilian-based Roi Normand, who showed he could sire American stakes-quality runners, we will most likely see his continued influence through his daughters and granddaughters (via Affirmed). With such promising young sires as Harlan’s Holiday and Pleasantly Perfect carrying his genetic material, we should see the classic influence of Exclusive Native for years to come. Herbager (1956, 428 foals, 64 SW, 3.30 AEI) – A predominantly stamina-oriented influence, Herbager was a mainstay near the top of the sire lists during the early 1970’s where his progeny would include successful sire Grey Dawn II and 1977’s champion three year old filly Our Mims. Breeders looking to add stamina to the predominantly speed-oriented American gene pool would be wise to seek Herbager out. Even with the prejudice against stayers in this country, Herbager is likely here to stay for quite some time through descendants Devil’s Bag, Devil His Due, Rahy, and Two Punch. Lord at War (Arg) (1980, 381 foals, 47 SW, 2.59 AEI) – A champion miler in Argentina who continued his prowess on American tracks, Lord At War added six graded events to his resume after crossing the border, including the Grade 1 Santa Anita Handicap. 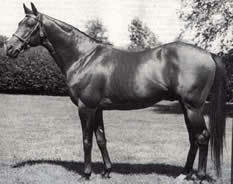 In an abbreviated stud career hampered by a disdain for his South American pedigree, Lord At War took advantage of his short time in the stud (he would die prematurely at the age of 18) and demonstrated a genetic virility equal to his talent on the track, getting over 12 percent SW’s from foals. Unlikely to carry that success on as a sire of sires (Patton faltered badly after getting impressive sale-types), Lord At War is off to a quick start as a broodmare sire with his daughters outperforming their opportunities (2.01 AEI vs. 1.82 AEI). My Babu (1945, 366 foals, 41 SW, 2.27 AEI) – Imported to the United States in 1956 after a quick start at stud in England, My Babu continued his successful stud career by getting the classic-placed Crozier (2nd in the Kentucky Derby) and 11.2 percent stakes winners from foals. Besides being the broodmare sire of 1967 champion three year old filly Gamely, My Babu can take credit for siring Missy Baba, dam of Raja Baba and originating a female family that produced A.P. Indy, Summer Squall, Wolfhound, and Foxhound. Tentam (1969, 213 foals, 35 SW, 2.93 AEI) – A half brother to successful sire Known Fact and prolific broodmare Secrettame (dam of Gone West), Tentam lived up to his heritage in a tragically shortened stud career (he died in 1981 at the age of 12) by getting a remarkable 16 percent SW’s from just 213 foals. Less precocious than most of his peers, but able to get 9-10 furlongs with minimal effort, Tentam’s presence in American pedigrees has shown a remarkable amount of resiliency. He can be found close up in the pedigrees of Citidancer and Northern Afleet, as well as in the pedigree of Grade 2 winner During. It is daunting to imagine the presence Tentam might have established in the American Stud Book had his life not ended so abruptly. T.V. Lark (1957, 368 foals, 53 SW, 2.86 AEI) – Either the disdain for turf horses was markedly less during his era, or T.V. Lark was one of the most underrated and overachieving sires of the last half of the twentieth century. America’s turf champion of 1961, T.V. Lark was an iron horse of sorts, competing 72 times with earnings of $901,194. Arguably, however, his biggest accomplishment would come at the end of the 1974 racing season where he found himself atop the American General Sires list. T.V. Lark currently maintains a presence in the stud books through Bertrando and Officer. Vaguely Noble (1965, 727 foals, 70 SW, 3.25 AEI) – A long shot to maintain an influence in an American racing milieu obsessed with early-maturing speed, few sires in the history of the breed instilled as much stamina and soundness in their progeny as Vaguely Noble. An unlikely import to the United States (he had required a significant distance of ground and carried one of the most obscure pedigrees to ever set up shop in the U.S.), Vaguely Noble would sire stayers of the highest caliber, including Dahlia, Exceller, and Lemhi Gold. Skeptics of the current American racing model would be wise to pursue the influence of Vaguely Noble. A lifelong student of bloodstock topics as well as being an active owner and breeder, Mr. Hall advocates the importance of empirical research to identify truth in breeding practices. His articles have appeared in such magazines as The Blood-Horse, Thoroughbred Times, The Mid-Atlantic Thoroughbred, The Texas Thoroughbred, The Homestretch, Illinois Racing News, Hoofbeats, The Louisiana Thoroughbred and El Caballista. Mr. Hall holds a degree in journalism from Boise State University. An enthusiastic and dependable member of our team, Mariana specializes in data collection and interpretation for our statistical research projects.